For the past few weeks I have been on a vegetarian diet (eating no meat and fish) to help myself become healthier and feel better, inside and out! – I called this my 28 Days Crave Veggies Challenge. As I enter my final (peas-ful) days on a vegetarian diet, I ask the question: Would you go meat-free for a day, or weekend with me? It’s actually easier than you might think. This personal meat-free challenge has been a new food experience, I have seen myself cooking more at home from scratch, being more adventurous with vegetables and flavours to replace the flavour of meat, and have felt less bloated and tired. Homemade Strawberry breakfast smoothie, made from 5 strawberries, porridge oats, water and soya milk with natural honey to sweeten. We opted for Indi-Go (Westfield Stratford), serving a wide variety of Indian street food dishes and bites from their open kitchen. 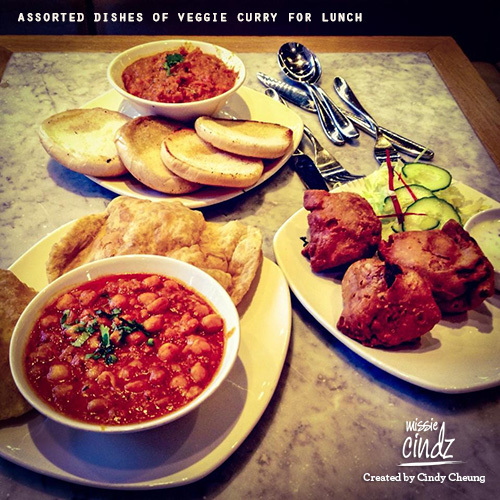 Indian street food, is clearly the in-thing on the London dining scene right now. There were standard curries with rice and breads on the menu at Indi-Go, but we went with three choices from the “Appetizer Bites” section: Pav Bhaji (V) – mashed vegetables in a tangy cumin sauce served with hot toasted bun, Channa Puri (V) – tangy chick peas with wheat bread puri and a dish of vegetable samosas. 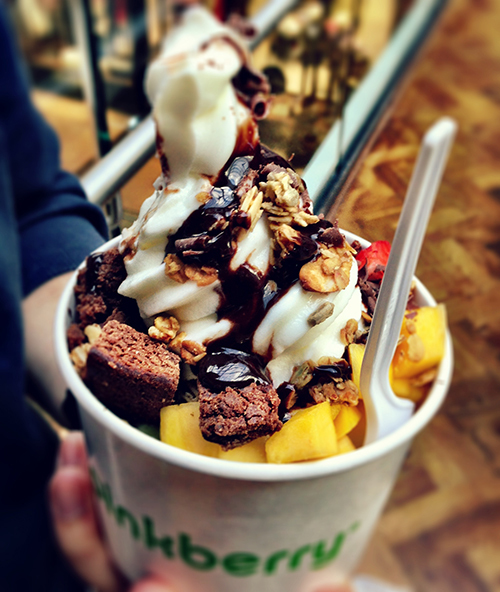 A huge Pinkberry frozen yoghurt topped with fresh fruit and desserts. Oh yes! Ice creams are so passé! – Have a sweet Easter weekend everyone. Indulge in fun, friendship and chocolate, and make some time for the ones you care about the most!